From Shop Street to Galway’s Westend, the streets will be full of music and dancing for New Years in Galway! Ring in the New Year in one of the best places for a night out in Ireland. 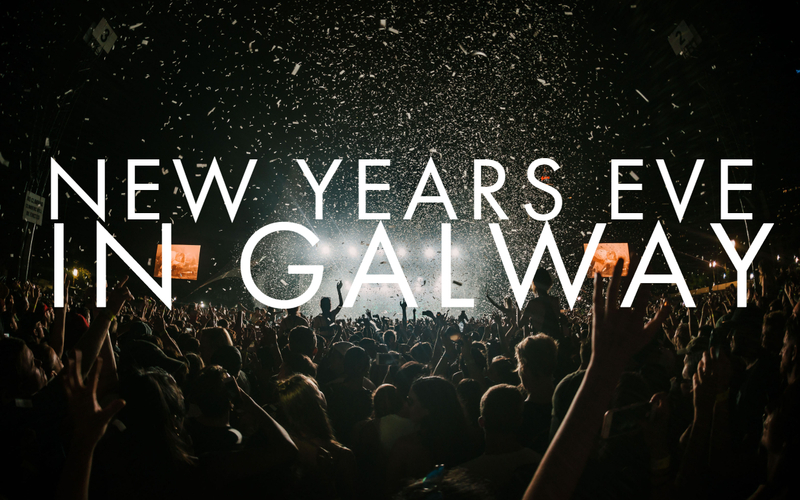 Check out what’s on in Galway for New Years Eve here and see the full calendar for the weekend ahead here. The Skeff’s “New Dawn, New Day” celebrations this new years eve kick off from 3pm with live music entertainment including a fireside traditional music session in the afternoon followed by a live performance of funk and soul, and the Kings of Connaught from 8:30pm and a live DJ til late. It’s going to be a great night with cocktails, whiskey, pints and a midnight toast when the Skeff’s balloon ball drops! Halo is becoming the Moulin Rouge this New Years with their “Come What May” Moulin Rouge celebration! Expect sparkling entertainment, costumes, bubbles, epic music and dancing til late, all based on the musical-movie Moulin Rouge. Also, there’s bottomless Prosecco for all presale ticket holders… Sold! Hard Candy is returning to Electric for this year’s new years celebration! Joining them in the Factory for the celebrations is Qugas (Login Rec) and Hard Candy resident Tatumba all night long. For deep techy vibes and dancing, this is the place to be. For a new years celebration (slightly) away from the madding crowd, head to the Black Gate for an evening of jazz! They’ve got a great lineup of jazz musicians for the night, two fancy new beers on tap and it’s going to be a great night. JazzGate for New Years! New Year’s is always a special night in the Róisín Dubh, and this year is no exception. Following their sold out show in July, we are filled with all kinds of joy to have LE BOOM headline the festivities. Le Boom are one of Ireland’s new music success stories having garnered 850k + streams for their two singles thus far. Christy Leech and Aimie Mallon have quickly become one of the most sought-after new acts in Irish music. Spend the weekend in the heated beer garden with live music every day! On Friday, it’s Ol Trusty followed by DJ Dave til late; Saturday is Feedback and a late DJ; Sunday is Half Mile Down; and New Year’s Eve brings a party til late with DJ Ferg. Cocktails and good times all weekend! Festive gin drinks and friends makes for a perfect New Years Eve celebration! Call into Tigh Nora for all your gin needs to get the celebration going this year. The Front Door, connected at the back of the bar, will also be a hopping spot for New Years Eve drinks! The Yard at the House Hotel is newly redecorated and totally fabulous or a New Years Eve destination! They’re bringing back their famous masquerade party for this year’s celebrations! Reserved areas, amazing cocktails and finger food makes it a special place to ring in the new year with friends. Head to the newly refurbished space, the Hall at Busker Brownes for a big New Years bash! Find it on level three above the bar. The first 50 in the Hall before 8pm will get a complimentary glass of Prosecco, followed by cocktails, drinks and dancing all night long. The Liquor Lounge is celebrating their first New Years in Galway with a big prosecco-themed bash! DJ tunes, a big midnight countdown, bespoke prosecco cocktails, prosecco by the bottle, and sweet treats await for a lovely night above the Dáil Bar. No cover charge, cocktails, and two floors of music make Seven a perfect destination for all your new years’ celebrations. The party starts at 9pm and there’s no cover charge!